It was closed again at 8 pm Tuesday due to a spot fire along the East Entrance road. It is closed until further notice. The road had been open for 12 hours since the previous closure. Update Aug. 16. The East Entrance is still closed. Here is the detailed story from the Billings Gazette. Fire jumps outside Yellowstone Park. Businesses see traffic redirected from East Entrance closure. By Ruffin Prevost. Billings Gazette Wyoming Bureau. Here is the latest on the Columbine Fire from Inciweb. It’s now 13,000 acres. 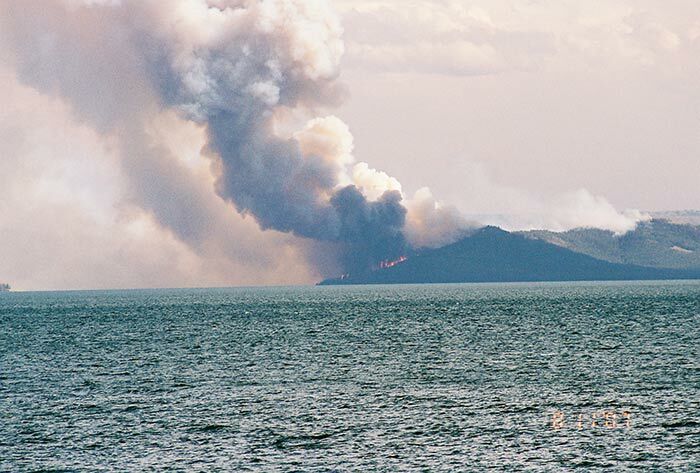 The fire on The Promontory in Yellowstone Lake was very active yesterday too, and my colleague Mark McBeth captured a good photo of it. Telephoto of fire on The Promentory Aug. 15. Copyright Mark McBeth.